Pure Denim Collection is strong, raw, and has character. That�s why it�s the perfect blend of fashion and workwear. Real denim is alive! The more you wash it, the more it comes to life. Wash and treat it as you want. Pure Denim takes on your identity. Be daring and combine the style that fits you. The Pure Denim collection is not suitable for industrial cleaning. Please note that denim may bleed. Avoid contact with light-coloured furniture or clothing. Everybody loves denim! The real jeans lovers can indulge themselves. 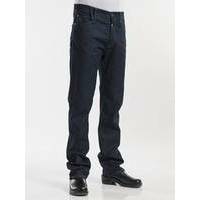 For them we have developed these Chaud Devant Chef Pants Jeans Blue Denim Stretch. They come with a handy back pocket for the chef�s tools and a large loop to tie a kitchen cloth.